Can You Drive With A Dog In The Car? How many driving lessons do I need? What happens in your first driving lesson? Open for bookings throughout the Easter Holidays. Sale ends 22nd April at 6pm. DID YOU KNOW? You could now receive up to a £5,000 fine and lose your licence for driving with your dog in the car! What Happens If Caught Driving With A Dog In The Car? New statistics show that more than half of drivers are unaware that driving with your dog not adequately restrained could leave you with up to a £5,000 fine and void your insurance. You’re probably wondering why you could receive such severe consequences for letting your four-legged friends on board. Well, at least 10% of drivers admit that they have had an accident, incident or near-miss due to having a pet in the car, or at least know someone who has. Dogs climbing into the passenger seat for company and causing numerous blind spots or blocking the view ahead. Dogs jumping out of the window while stationary at a traffic light, running into traffic, approaching pedestrians or other dogs. Many drivers instantly jump out of the car without thinking to retrieve their pet, putting both themselves, surrounding road users and their dog in danger. Cats escaping from their cage or getting bored and climbing into the footwell then curling up to fall asleep next to the pedals. Why Are There Such Severe Consequences? Rule 57 of The Highway Code states that dogs, cats or any other animals must be suitably restrained while taking a ride in your car. Animals can be in your car if they cannot distract you, injure you, themselves or other road users and will not cause you to emergency stop. They must be restrained using a seatbelt, harness, pet carrier, cage or guard. Many drivers discourage the rules of The Highway Code because The Highway Code itself does not hold any penalties if disobeyed, however, police officers and the law use this as a guideline for offences such as dangerous, distracted or careless driving. If police officers believe that your pet runs the risk of causing a driving danger, they have every right to pull you over and inspect your vehicle. If failure to restrain your pet while driving caused an accident, it will be classed as careless driving. The offence of careless driving holds a maximum of a £5,000 fine and 9 points on your licence, which is enough to be put on a driving ban and have your licence revoked. Drivers in their first two years of driving have a maximum of only six points on their licence before it is cancelled. If you are put on a driving ban, you will have to re-do your test to get back on the roads legally. Not only does being charged with careless driving mean that you run the risk of losing your licence, but your insurer is within their right to refuse to pay out for damages meaning you will be forced to pay the full extent of your damages. For full details on the latest consequences of careless driving, take a look at our previous article! As mentioned previously, there are many different options to restrain your pet while driving which will not only make sure you stay within the law but also that your furry friend is comfortable. It’s important to understand that one of the biggest reasons as to why dogs go rogue in a car and start to cause problems is because they have become nervous or frightened. Many dogs first trip in the car is to go to the vets which for many is seen as an unpleasant experience that often causes distress. Therefore, for every car journey afterwards, they automatically associate being in the car with going somewhere they will not like, making pets anxious, just like we would. To stop your dog from becoming anxious at the thought of travelling and to prove to them that the car is a safe place to be, it is recommended to take them on a few short trips to fun places. Find a long walk your dog will love a little further afield and take them there in the car, so when they arrive, they realise that not all journies are daunting. Always ensure that you have a bottle of water and collapsible dog bowl on board, even maybe a small bag of treats, just in case the journey takes a little longer than anticipated. Again, keeping your pet comfortable and stress-free. As mentioned previously, The Highway Code states that you must use the right equipment to restrain your pet, the best option for you often depends on the size of your dog. A mesh dog guard is best suited to larger breeds which need a considerable amount of room to move freely. If you have a bigger boot, a guard would be perfect as it will give your dog its own section of the vehicle and they will still be able to see and interact with you. 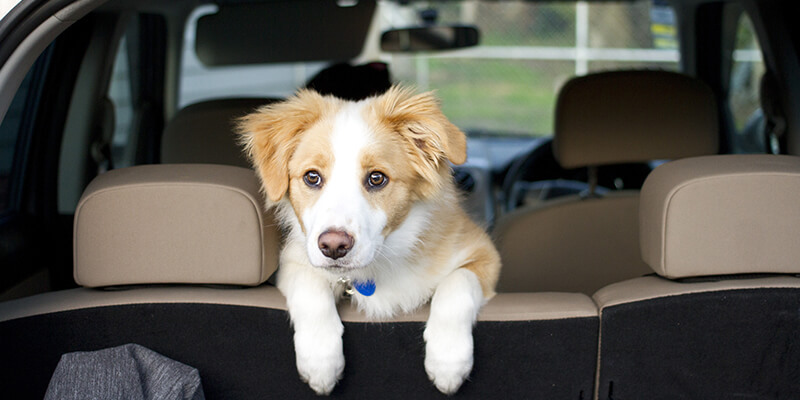 Both removable and permanent barriers are available depending on how often you plan to take your pet on trips. A dog car harness serves the same purpose as a seatbelt does to us during journies, it goes across the body to keep you safe and secure. The harness clips into the car’s seatbelt and can be adjusted to fit your pet’s body comfortably. It means that in the event of an emergency stop, they will not be forced towards the front of the car and will not be able to move around the vehicle. If you have a small dog, such as a Bulldog or Chihuahua, a transport carrier would be the best option for you. You must ensure that your carrier is large enough for your pet to stand up and move with ease, to avoid frustration. An anti-slip mat must also be purchased to make sure that the carrier stays in place when turning, braking or accelerating. Every law and regulation states that you are more than welcome to take your pet on board, but only if you take precautionary measures to keep them, you as the driver and all other road users safe. Invest a little more money into restraining equipment that is comfortable for your dog and leave extra time to plan your journey! © 2019, drivejohnson's - All rights reserved. Sorry, you've exceeded the number of purchases allowed on this product. We're offline at the moment, but please leave a message below and we'll get back to you as soon as we can. Thanks, your message has been sent. Your message could not be sent at this time.